UNDATED - South Dakota corn stocks in all positions on March 1, 2017 totaled 479 million bushels, up 10 percent from 2016, according to the USDA's National Agricultural Statistics Service. Of the total, 310 million bushels are stored on farms, up 13 percent from a year ago. Off-farm stocks, at 169 million bushels, are up 4 percent from last year. Soybeans stored in all positions totaled 92.0 million bushels, up 42 percent from last year. Onfarm stocks of 37.0 million bushels are down 6 percent from a year ago but off-farm stocks, at 55.0 million bushels, are up 116 percent from 2016. All wheat stored in all positions totaled 82.1 million bushels, up 25 percent from a year ago. 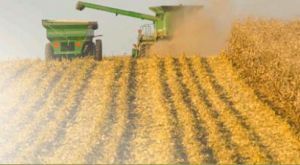 Onfarm stocks of 37.0 million bushels are up 19 percent from 2016 and off-farm stocks of 45.1 million bushels are up 30 percent from last year. Sorghum off-farm stocks totaled 3.89 million bushels, up 37 percent from March 2016. Oats stored in all positions totaled 3.97 million bushels, down 35 percent from last year. Onfarm stocks of 2.90 million bushels are down 33 percent from 2016. Off-farm stocks of 1.07 million bushels are down 40 percent from last year.